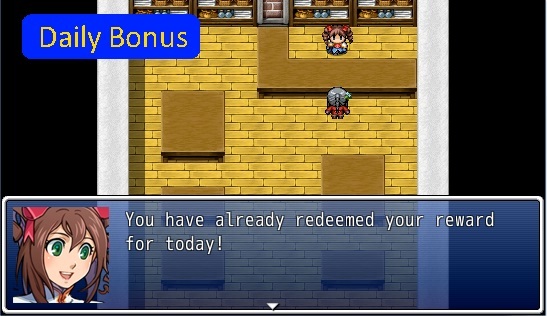 This script provides a simple “daily bonus” mechanic, allowing players to receive bonus rewards once a day. It assumes that you can get a bonus on a new day, but you can write your conditions to use different periods if you want. It is intended for offline games and uses the player’s system time to reward bonuses and to determine whether rewards can be rewarded. In order to provide developers with more control over the rewards, script calls are provided. It is up to the developer to determine how to set it up for their game. The following script calls are provided. method returns true only if the day is different from the last recorded day. whenever a bonus is rewarded. Suppose you decided to create an event that serves as the reward NPC. Use a variable to determine how many times you have received rewards. You would have a conditional branch that checks whether login bonuses are available. If so, you would then go through a series of variable checks to determine which reward to give them. Finally, you would call update_bonus_time to log the actual reward. I’ve updated the script so that you can specify exactly how many seconds to wait before the next reward is available. Once again, your work is awesome but I&apos;m really noob on scripting so I&apos;m pretty lost: how do you change the timer for the reward? I&apos;m wondering if you were able to upload a master demo of your scripts or something like this (I guess a demo for each script is way too tiresome), since I can see how it works by my own more easily. The easiest way would be to find a script that allows you to compare two times and then use it in a scripted conditional branch. I don&apos;t provide that functionality in this script because that is not the purpose of the script.